A lot of people are opting for the smooth finish of concrete for both interiors as well as exteriors of their buildings today as a number of dealers and companies are coming up with various options in polish concrete rendering wall. New innovations in concrete surface coating materials, new textures now let you get a finish and look that beats vitrified tiles or granite. Let us check out the factors that are needed for that perfectly smooth finish. •	A team of professionals who are aware of the technicalities about when and how to apply the materials and provide a smooth finish as well as has creative ideas to convert surface coating design ideas into reality. •	The quality of surface coating materials and sealants used are also equally important. Different quality materials from different brands have a different range of texture. Hence, depending upon the wall and the smoothness that is required, different brands and materials are used. •	The place of the wall also is an important factor such as the interior of the building or the exterior of the building. Now for the polish concrete rendering there can be a variety of design options that you can go for. If not all, then a few are discussed here below. This is the design that is free from any kind of fuss and is the simplest of all. Also, it is the cheapest one in terms of price as it does not have much of designing in it. 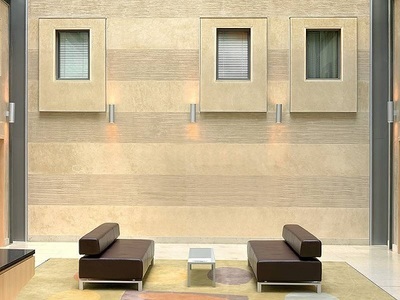 The polish concrete rendering wall is available with simple details and straight edges. The surfaces are quite polished and these days many people wish to have some patterns and designs on it. Such patterns are made in a way that will look elegant and simple. Now, this is again another simple to do yet a trendy design that many people go for now. The background is offered white base and the geometric shapes such as rectangles and circles are created on the white base with some great colors matching the interiors of the room. This is one of the simplest and safest designs that you can go for if you wish to have the polish concrete rending walls in a simple yet trendy way. If you wish to have the polish concrete rendering wall in some of the special places such as the open kitchen or the huge wall in the drawing room, then this is the perfect option that you can have. You can have the base of the wall as the normal white to off-white to even other shades of gray. The front portion is left out for some bold colors to be spread out in different pattern forms. This is one of the stylish looks that one can have. If you wish to have a Venetian look, then this is the one that you can go for. The wall is prepared with a combination of marble powder, slaked lime, and others along with concrete. There are almost more than 70 colors that can be used for such a stone look. HD patterns are the new look that many of the people wish to have as a part of their buildings. There are a number of designs that such polish concrete rendering walls can offer such as that of a rippling wave or a broken wall. Just let your imagination fly and you can get the wall pattern that you always wanted to have. These days, a combination of ideas comes up for such wall designs. 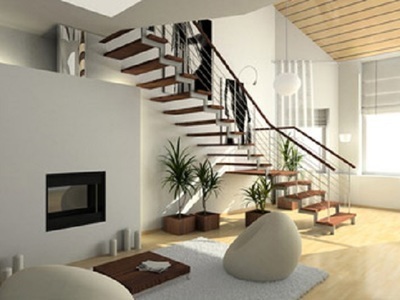 Some wish to have a simple and trendy look while some others wish to have a modular look with patterns and styling. In either of the cases, the concrete walls with a smooth finish are the perfect option to provide.